Moving time: 3 hr 56 min. Weather: 55° in the morning; warmed up to about 72°. Cool riding down hills! My Achilles Tenon loves to yell! Today was a pretty nice day. 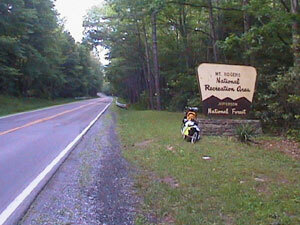 I rode along some mildly rolling terrain for about 10 miles from Rural Retreat. Then I began to climb about 1500' up into Rogers National Forest. The National Forest Service permits horseback riding in the forest and it seems to be a very popular pasttime around here. I probably saw half a dozen horse trailers parked along side the road and a few riders making their way along horse paths. I stopped off at a gas station that also serves food for lunch just after I crested Mt. Rogers. There was a youth group there who was camping in the area. I talked with the group leader and some of the high school age boys who were interested in what I was doing. They seem to be having as good a time as I am. The quick descent down into Damascus was very fun. 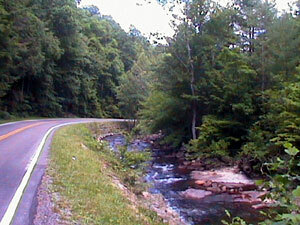 The road followed a river most of the way and I saw the Virginia Creeper Trail, a popular Rail Trail project. It was a short riding day since I wanted to experience all Damascus had to offer bikers and hikers. I also wanted to get my ankle looked at. The first picture is the entrance to the park and the second is at the top of the mountain where there are lots of farms and ranches with cattle and horses. The third picture shows the stream that I rode along the whole way down the mountain to Damascus. It was about 8 miles of pure downhill at about 25 mph. A great way to ride a bike! When I reached Damascus I must have looked a little lost as I stopped at an intersection and studied my map. A haggared gentleman in a beat up 1/2 ton pickup rolled up beside me, leaned out his window and said,"You lookin' for 'The Place?'" I nodded and he pointed me in the right direction. 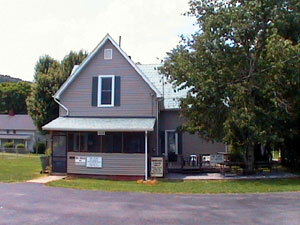 "The Place" is a hostel for TransAm riders and Appalachian Trail hikers. 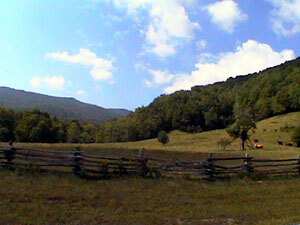 It is legendary among Appalachian Trail hikers and a makes for a good place for bikers to stop too. I met five hikers there who were either on their way in or out. One hiker, Barry, had been there the night before, headed out on the trail, then hiched a ride back to town since his shins hurt him really bad. We got talking and he had tendonitis in his achilles tendon just like I have - exactly the same syptoms. Pain and a creaking feeling when it moves. He saw a doctor who gave him Prednisone that healed him right away. I decided that's what I should do. So... I went to the local clinic to see a doctor but they were booked for the day. I have to go tomorrow morning at 9:00am to see her and hopefully get cured of my pain. If it works then I'm home free and should be able to make good mileage from here on out. 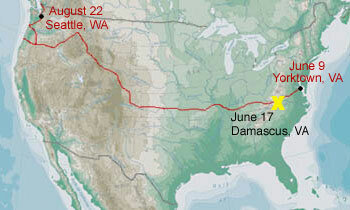 I'm below my daily average to make it all the way to Vancouver but I hope to make it up. This town is perfect for Appalachian Trail (AT) hikers and TransAm riders - a bike shop, an outfitter, a laundromat, restaurants, a cyber cafe, and all the other usual fixtures. 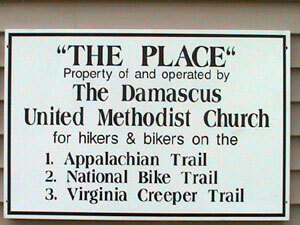 I stayed at "The Place" hostel which is famous both on the AT and TransAm. My appetite is back in full force! I got a chance to do my laundry at Lorna's Laundromat across from The Cowboy (gas station, market, and restaurant all in one), buy some parachute cord to hang a bear bag from (left the last one in a tree two days ago), and got some food to take with me. I also bought a nice riding jersey that was 1/2 off the Adventure Damascus bike shop. AT hikers are quite a group. I'm not sure I fit in with them too well. They are mostly in their late teens and 20s and have little to do with themselves but hike the trail. Some are very nice but others are just plain nomads. They all have these crazy trail nicknames that we cyclists don't. One guy I met is "El Toro," the others I can't remember since I have a bad memory and they are not very descript. A lot of them are things like "Cloud Walker," "Blister," "Oatmeal," "Going Up," and the like. Like bike riders, AT hikers have guide books and maps, mostly from the ATC.